The R8 costs a mere $850 and a body shot will be enough to drop anyone, regardless of body armour. Presuming you can judge those lengthy trigger-pulls, that appears to be monstrous stopping power, but our best man is on the job so we'll have solid analysis for you soon. Joining the R8 in the Winter Update is the Killer Replay feature, which allows you to relive your deaths from your opponent's perspective in Demolition and Casual modes. Given that this will force me to confront how many deaths are my own damn fault, I'm not entirely thrilled. In competitive matchmaking, meanwhile, your team is now able to vote for a 60-second timeout if the stress is all getting a bit much for you. 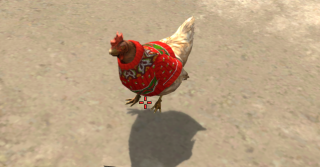 Of course, all of this pales to insignificance against the news that chickens now have Christmas jumpers. The full patch notes are here.